It was a good week for Hillary Clinton. 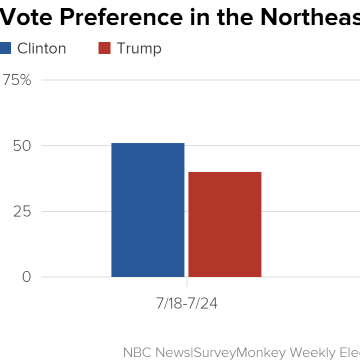 Not only does the Democratic nominee lead Donald Trump by 8 points, a deeper dive into the latest NBC News|SurveyMonkey Tracking Poll shows that Clinton received a bounce across the entire country — making gains in every census region. Winning the presidency requires securing Electoral College votes across a geographic range of states, so it is important to understand candidate support across different regions in the country. Below is a break out of our Tracking Poll results by Census region. Voters in the Northeast have traditionally voted for the Democratic candidate and, unsurprisingly, Clinton is doing very well in that region. She is up 2 points among Northeast voters (51 percent last week to 53 percent this week), and her advantage over Trump went up from 11 points last week to 14 points this week among voters in that region. 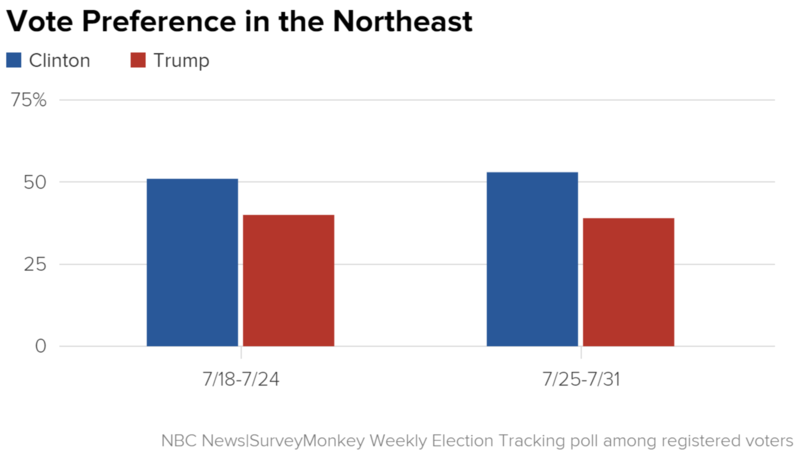 Trump’s support among Northeast voters is relatively unchanged, 39 percent this week from 40 percent last week. In the Midwest, where states like Wisconsin and Ohio are typically battleground states in a presidential election, there was some movement. 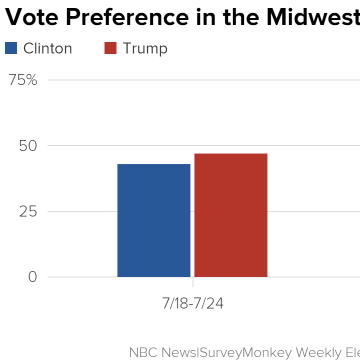 Last week, Trump was leading among Midwestern voters, 47 percent to 43 percent. This week, however, Clinton is in the lead, 47 percent to 44 percent. The 7-point swing in Clinton’s favor could be a direct result of the Democratic National Convention last week. 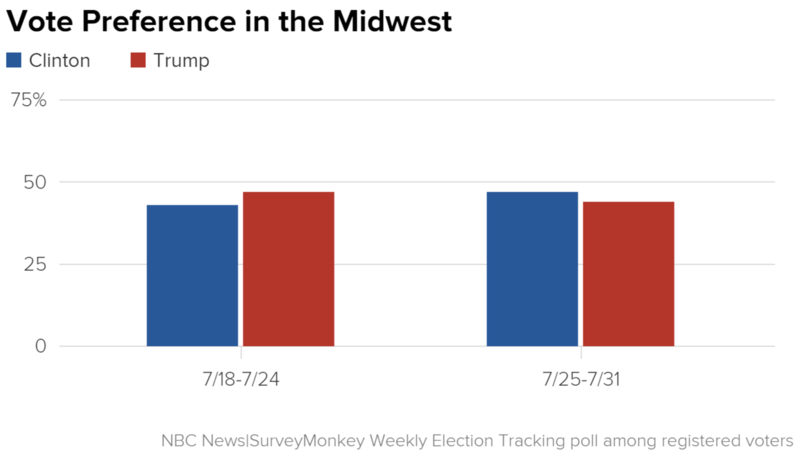 Trump has fallen 3 points among Midwestern voters this week at 44 percent, down from 47 percent last week. This week Western voters have also leaned heavier in Clinton’s favor; she has 56 percent support from that group, up from 52 percent last week. Clinton went from a 13-point lead over Trump last week to a 21-point lead over him. 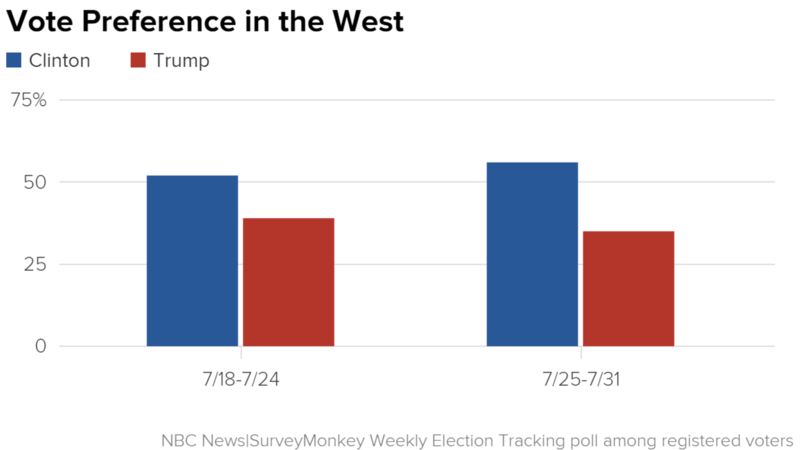 Trump is down 4 points from last week among voters in the West, 35 percent from 39 percent. Perhaps the biggest surprise in the results can be found in the South, which is typically a Republican stronghold in a presidential election. While Trump won this region both weeks, his lead dropped significantly this week compared to last week. He was up 10 points –51 percent to 41 percent—among Southern voters last week. This week he is up 2 points among the group—48 percent to 46 percent. Clinton’s support among Southern voters is up 4 points from last week—41 percent to 46 percent. The NBC News|SurveyMonkey Weekly Election Tracking poll was conducted online July 25 through July 31, 2016 among a national sample of 12,742 adults who say they are registered to vote. Respondents for this non-probability survey were selected from the nearly three million people who take surveys on the SurveyMonkey platform each day. Results have an error estimate of plus or minus 1.2 percentage points. For full results and methodology, click here.